In the increasingly competitive multifamily industry, developers are seeking solutions to enhance their market position. At the same time, with rising costs for labor, equipment, and materials, the ROI for every construction project is front of mind. Today, as developers look to optimize rentable/saleable square footage and decrease costs, the building industry is exploring new applications with modular design, optimizing parking garage configurations, and efficiently arranging living units. Interestingly, MEP strategies significantly contribute to achieving these decisive development objectives. Optimizing rentable/saleable square footage is a key driver of a developer’s project performance model. In general, MEP systems present planning challenges in allocating the significant space they require while still optimizing usable/rentable/saleable square footage. As a result, project teams seek creative solutions to optimize available space, both horizontally and vertically. To minimize the MEP impact on floor plan square footage, horizontal distribution systems offer an advantage. Horizontal HVAC solutions with distribution in the ceiling allow designers to regain square footage on the floor plan. Pairing this approach with ductwork terminations at the exterior of the building translates to real dollars for developers. VRF systems with ducted fan coils and horizontal HVAC distribution in the ceilings take up less space than a traditional vertically configured water source heat pump (WSHP) or four-pipe fan coil configuration. Another option utilizes vertically configured, stackable mechanical systems that hug the same wall of directly adjacent multifamily units. Whether these units are WSHPs, VTACs, or fan coils, when placed at adjacent and/or exterior walls of living units whose plans mirror one another, this configuration offers advantages when it comes to distribution, ventilation, and exhaust by utilizing opposing soffits within the unit. Additionally, these units can share risers and limit additional floor space required for the distribution of the water or refrigerant systems. This approach has several benefits: consolidation reduces the complexity of the distribution within the space and the effect is less prominent visually on the outside of the building. On the vertical plane, reducing floor-to-floor heights is another area where designers are starting to push – actually compress – the envelope. Vertically, the way to reduce floor-to-floor heights is to reduce the amount of equipment and ductwork in the ceiling space. This is another mechanism to optimize the saleable square footage of the building. For example, in a tower, by reducing the floor-to-floor height by 6 to 12 inches, the building will eventually net enough verticality to add an additional floor, substantially increasing the saleable square footage without raising the building height. Lower floor-to-floor heights can be challenging, however, when housing infrastructure in the ceiling, especially in wood-framed buildings with tighter ceiling spaces. One opportunity to capitalize on space is running ventilation and exhaust ductwork within the space between parallel joists of wood frame construction to the exterior of the building. There are code considerations, but this strategy presents an opportunity to not only maintain the higher ceilings but also eliminate shafts that take up saleable square footage. While a wood frame building is inherently more challenging in minimizing floor-to-floor heights when compared with PT construction, with the right design integration technique and channeling ductwork within the routes of parallel joists, it is possible to get the best of both worlds—higher ceilings and more saleable square footage. All of these approaches can increase the maximum rentable square footage, but designers need to keep in mind the trade-offs and how their design will function inside the units in regards to the comfort for residents. In a large development, project teams can optimize square footage and reduce construction costs by decisively planning the MEP within the parking structure. One of the key goals for a parking garage is to reduce excavation depth and, by proxy, floor heights, putting pressure on ductwork, piping and electrical configurations. Because material and labor costs can vary widely among contractors, it can be advantageous to use a design-assist approach. 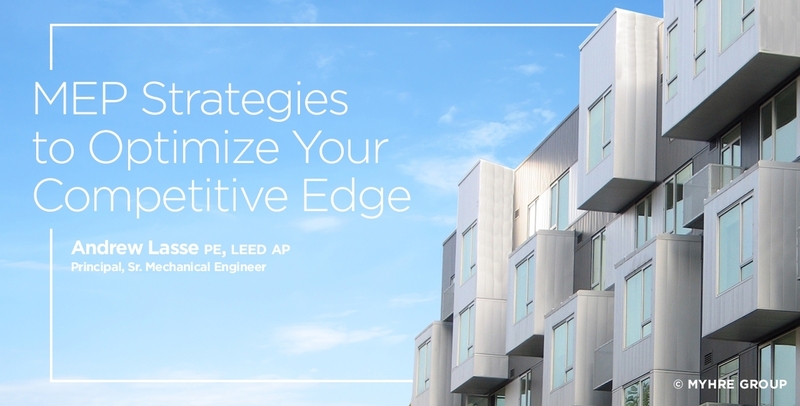 By soliciting feedback from the GC and subcontractors during the design phase, developers can accurately estimate the MEP budget as well as refine materials selection. For example, contractors will be more aware of pricing for copper versus stainless steel piping, or can determine the price differences of a ducted versus transfer fan ventilation scheme in a garage, which assists the team and provides real time feedback in identifying the most cost effective design approaches. Establishing these relationships at the project outset reduces change orders later in the project, increasing both speed and quality. Another way to reduce cost and congestion within parking garage ceiling space is to model the garage exhaust and fresh air supply using CFD (computational fluid dynamics). Using advanced software analysis, the model reveals how transfer fans can perform against a traditionally ducted system, while also resulting in a more predictable performance outcome. In a recent project, when fan locations were adjusted per the model, transfer fans were placed in a seemingly random configuration to achieve what resulted in an optimized uniform ventilation configuration – a solution counter intuitive to a more expensive evenly spaced fan placement with twice as many fans. This would not have been realized without the benefit of CFD. This resulted in a solution to ventilate the project that would require less fan horsepower, and he major savings were twofold: both a first-cost savings with reduced ductwork and nearly half the installed fans, as well as a long-term energy savings for the Owner. An additional emerging trend to optimize space efficiency is the use of parking stackers. By incorporating a parking stacker system, developers reduce the depth of excavation, and a smaller footprint means less infrastructure: lower MEP and, specifically, HVAC costs associated with the project. Modularity is another way to speed construction and reduce costs that is gaining momentum among multi-family developers. In many cases, it is less expensive to procure and install MEP systems within living units in a manufacturing setting, rather than assembling components at the construction site. The challenge is that modular construction can show dividing lines, double walls, and other visible clues that the units are prefabricated. Working closely with a modular construction contractor empowers teams to choose the right systems and craft installation plans. Developers should be aware of extra layers of complexity with the permitting process for modular designs. One of the primary challenges with modularity is in project coordination. In conventional design and construction processes, the working relationships are between the architect and contractor. Adding a third-party expert in modular design brings another layer to the coordinating efforts as well as a new set of considerations. The best way to get as much of the MEP systems installed as part of the modular manufacturer’s scope of work is compartmentalization. For example, with electrical systems, a unit may have two to three modular sections that make up one residential unit. This can be complicated because there is a single, shared electrical panel with conduit and wiring routed to the other modular sections. The best approach is to route as much conduit as possible into the panel and have junction boxes that terminate at the edge of the modular connections, rather than assembling all the conduit wiring within one unit and leaving the remaining connections to be routed later in the field. In this way, installation is done by the modular contractor in advance, making field installation easier. On the HVAC side, self-contained systems are very efficient for modular projects. However, split heat pumps with remote condensing units also work well for these types of projects. If roof space is a concern, VTAC (vertical terminal air conditioning) units can replace the remote condensing units on the rooftop, freeing up space. Individual exhaust systems could also be run horizontally, minimizing the vertical shaft systems that both take up space and add a layer of coordination due to complexity. With the cost savings and shorter ROI periods of modular construction, there may be room in the project budget for higher level solutions like individual heat recovery ventilators that improve indoor air quality and save the owner on energy costs. The ability to invest dollars saved elsewhere into more efficient solutions is the payback for the intensive early coordination efforts. The key considerations for modular construction center around merging independent units to effectively blend the components together. With the right modular design company, the craftsmanship will be high quality, built in the shop rather than being assembled in the field, so the building project team can primarily focus on the risks associated with installation on site as well as the interface with the core parts of the building, integrating infrastructure as seamlessly as if the project were non-modular. Optimizing the rentable square feet by moving equipment and infrastructure off the floor is appealing to occupants and developers alike. New methods can be daunting to plan and execute, but the rewards are substantial, and the lessons learned can be applied to future projects, giving experienced teams the edge as trends become the norm.